With Thanksgiving leftovers and weekend desires for sweet eats I opted to make a few substitutions and alterations to a recipe found in the Gooseberry Patch Pumpkin Cookbook. The recipe is for Pumpkin Coffee Cake and while I could have defrosted some pumpkin, I opted rather to use up leftover Craisin Cranberry Sauce and turned out a quite delectable Coffee Cake. Blend together 1/2 cup Butter, 3/4 cup Sugar and 3 eggs until creamy; add 1 tsp. Vanilla. Mix in 2 cups Flour, 1 tsp. Baking Powder and 1 tsp. Baking Soda. Add 1 cup Sour Cream or Plain Yogurt (I used plain yogurt), set batter aside. Combine 1 1/2 cups Cranberry Sauce with 1 Egg and a dash of Cinnamon; set aside. Prepare streusel by combining 1 cup Brown Sugar, 1/3 cup Butter, 2 tsp. Cinnamon and 1 cup Sliced Almonds; set aside. 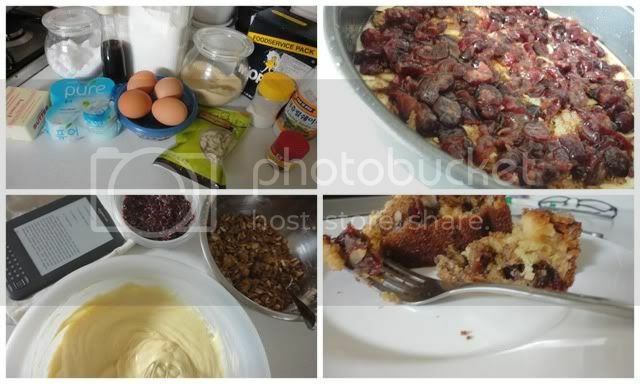 Using one large, well-greased 9x13 baking dish (or 2 cake rounds) spoon in half (or one quarter) of the batter, top with half (or one quarter) of the streusel then all (or half) of the cranberry mixture followed by the remaining batter and steusel. Bake at 325 for 50 minutes to one hour (or less for the cake rounds) enjoy with your morning tea.